Treat your plants to this wonderful,metallic effect planter - one of our largest! A large, very tough and durable planter that is perfect for trees and shrubs. Made to last from heavy duty polypropylene, with a rustic industrial design – yet at a fraction of the cost of a real metal pot – it will adorn your patio for many years. Stylish and modern, the hobnail pattern gives a contemporary feel to the planter, making it a feature in its own right. Being polypropylene it is also light weight, so easier to manoeuvre compared to metal or pottery containers. You'll receive a single, 17in silver hobnail planter. 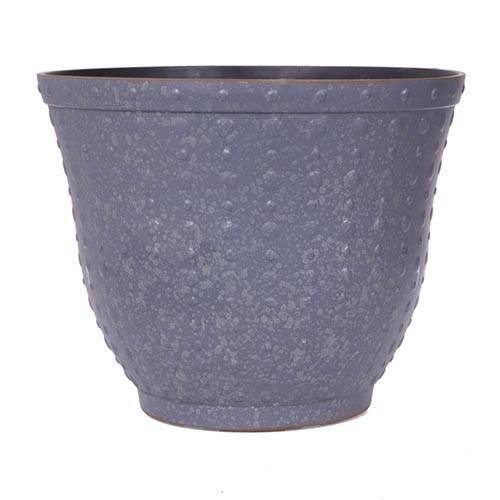 A large, very tough and durable planter that is perfect for trees and shrubs. Made to last from heavy duty polypropylene, with a rustic industrial design – yet at a fraction of the cost of a real metal pot – it will adorn your patio for many years. You'll receive a single, 43cm (17in) silver hobnail planter.